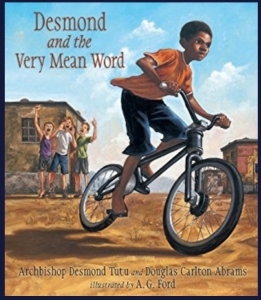 Abrams was Desmond Tutu’s co-author for God has a Dream and for his children’s books that include Desmond and the Very Mean Word. The latter book is based on a real experience that Tutu had when he took a new bicycle out for a ride and had his pride and joy turned to hurt and anger when a group of boys shouted a mean word at him. He responded first by shouting an insult, but learned that fighting back didn’t make him feel better. Through Father Trevor, he understands his conflicted feelings and sees that all people deserve compassion whether or not they say they are sorry. Abrams: At the end of the day, all children have experienced their own “mean word” and this story allows them to discover how to deal with their hurt, and shame, and anger…I think that children’s literature can channel that life in positive directions. I had dyslexia growing up and so books were for many years a locked room, but when I found the key, I discovered the treasure inside. Our responsibility is to make sure that every book a child opens is a treasure. Abrams said that his idea for the book came at a birthday party for Tutu’s wife. I was there with another friend and client who was the Chairman of the Dalai Lama Foundation. And he asked, “what do you think about these two guys writing a book together?” And I said, “Wow. What would it be about?” We both thought for a second, and we looked at each other and we said, “joy”. Because these are two of the most extraordinarily joyful people on the planet. 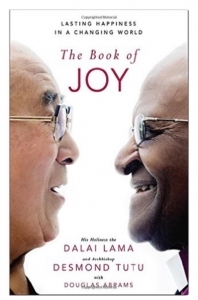 And so I turned over to Archbishop Tutu, and I said, “Hey, Arch,” as he’s often called, “you want to write a book with the Dalai Lama?” and he said, “I’d do anything with that man.” Because they love each other and they’re just fantastic friends.